Our UK multi-activity school trips are based at our flagship centre in Poole, Dorset and at our new centre at Bartley Reservoir near Birmingham. We offer a blend of challenging and rewarding activities that can be enjoyed residentially or on a day visit Primary School and Secondary School pupils. Check out our sample programmes below. "An excellent few days. The pupils have thoroughly enjoyed the trip. There is something for everyone. The children are kept busy. The organisation is second to none! Thank you! Nothing is too much for your staff." St Osmund's CE Middle School. If you have any questions please call 01202 677272 or message us on our Live Chat. *Rockley can tailor your trip to your specific needs, Bespoke/GCSE/BTEC can be arranged with the Rockley Schools Team. Please note, some additional activities are subject to additional charges. Keep doing what you do! We have been impressed with all of the staff at Rockley. All activity leaders were enthusiastic, knowledgeable and skilled when working with our children. As always outstanding trip with fantastic staff. The quality of instruction and over all helpfulness of staff involved in organising the week marks Rockley out as singularly the best school trip company I have worked with. Thank you and wish you all the best for the future. Just a big thank you. The boys had a great time and were really buzzing with excitement. The activities are amazing. Staff are incredible. So supportive and accommodating, passionate and enthusiastic. We have two centres in Dorset located in beautiful Poole Harbour and on Poole Park Lake and one in the West Midlands in the Bartley Green area of Birmingham. Our flagship centre at Rockley Point offers both day and residential experiences. 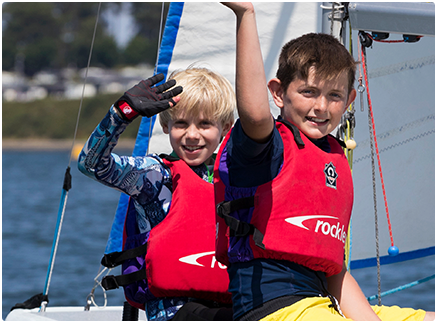 With unrivalled levels of instructor expertise, students can either enjoy a multi activity adventure which can include sailing, windsurfing, kayaking and stand up paddleboarding or gain RYA certificates in dinghy sailing. With a well appointed beach and a lovely beach side cafe, it's the perfect location to see your pupils thrive outside the classroom. Our Poole Park and Bartley centres are ideal for our daily sessions. 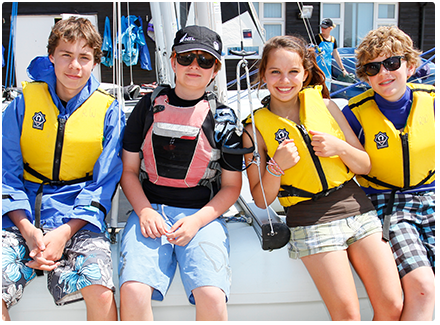 With shallow and extremely safe activity areas, they offer the best introduction to watersports for school children. 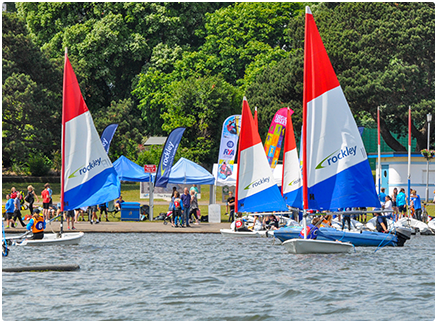 RYA certificated sessions are available in dinghy sailing or short taster and multi-activity sessions in sailing, windsurfing, stand up paddleboarding and kayaking. Our UK multi activity trips offer a unique blend of challenging and rewarding activities that can be enjoyed residentially or on a day visit. Our programmes are based around waterports activities suitable for a range of ages and abilities, with specialist RYA training programmes to multi activity programmes all tailored to your group's needs, we are sure we can provide a trip that works for you. Add in our range of optional and evening activities including beach games and racing down the water flumes in Splashdown and our trips deliver an experience-filled adventure that is fun and rewarding! Our experienced team work hard to ensure everyone in your group achieves success and enjoy learning through a mixture of fun and adventure which we are certain will ignite their imaginations. With many programme options and varying trips available, from a day visit to a week-long residential we are sure to find the perfect balance of activities and experiences against trip cost for your group. 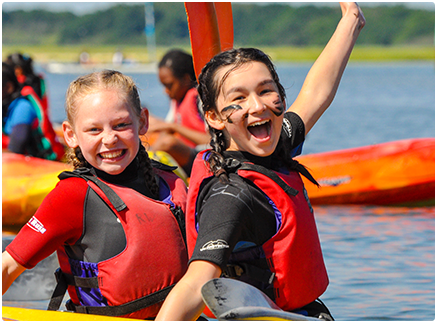 Of the many places in the UK for watersports, Poole Harbour offers possibly the safest and most idyllic location, offering a secure and happy setting for children to experience a residential trip away from home. With space for adventure, we offer diverse and challenging experiences which will inspire and excite your pupils. Residential trips can help children of all ages develop independence and bond with their peers and teachers in informal settings. They provide a wonderful opportunity for children to begin their journey as independent people with lives outside their own homes. A residential week with Rockley Adventure provides valuable opportinities for promoting teamwork, social skills and communication skills. Personal achievement combined with many new experiences in such a unique environment can be very rewarding and boost self-esteem and confidence. Healthy eating contributes significantly to the lives of children and young people. At Rockley, we ensure your pupils receive three healthy, balanced meals a day. For those staying with us at Rockley Point, all our food is prepared on-site at the Rockley Lodge by our own catering staff. Ingredients are fresh and locally sourced giving each child all the energy they need to enjoy their action-packed adventure. 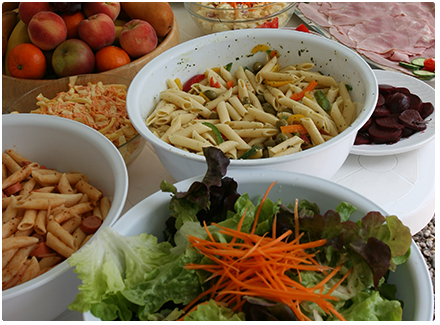 All our guests get provided with their essential five-a-day - with us, the only food choice is a healthy choice. The meal times are an important social aspect of the trip. At Rockley we ensure there is adequate time available to eat their meal and chat about the activities and learning that the children have experienced in the day. Our UK residential activity holidays provide an opportunity for your pupils to gain experience staying away from home. All the while trying new activities, expanding their skills and horizons and developing themselves through a variety of fun activities. We are firm believer that "activity + adventure = healthy lifestyles" and our activity holidays help to empower children to develop key skills and personal confidence in a fun and safe environment. All our programmes can be tailored to specifically meet the requirements of your group. We often work with Group Leaders to put together a more bespoke programme to fulfil specfic aims and objectives. If you have any questions about our activity programmes just give us a call. Around RockleyNot sure what you're looking for? Why not check one of these out! A unique adventure experience based at one of 3 lakeside centres in southwest France. We have selected locations for our centres that provide a safe yet challenging environment set in beautiful surroundings. Together with Group Leaders we can create a bespoke programme to fulfil specific objectives. We are dedicated to providing you and your group an action-packed adventure, request a quote today.